Things haven’t always been easy for Sean Anthony, a REALTOR at Howard Hanna Realty Pioneers in Towanda, PA, who was recently named to REALTOR Magazine’s 30 Under 30. He hails from an area called “The Valley” with three small cities and just 23,000 people. But it’s that very same community that motivates Sean to do what he does best – help other people achieve their goals. Some of Sean’s first memories revolve around growing up in a trailer and moving into his childhood home, a two-story brick house. He remembers needing to get into a car and drive long distances to do simple things like taking pictures with Santa. To take his real estate licensing exam, he had to drive three hours away. So, inspired by his uncle, he decided to get licensed as a real estate agent. For three months, three times a week, Sean worked eight hour days, followed by a lengthy drive and three hours of evening classes. “Those were some rough and long days,” Sean admits. Inspired by his friend, Sean took the test a third time. “I felt an energy that I’ve never felt before, almost like it was meant to be – a greater energy helping me focus to an extent I’ve never thought I was capable of before.” He passed with flying colors. “I broke into tears!” says Sean. He keeps his successful test results above his desk as a reminder. “When times get tough, it’s just life testing your abilities to grow,” Sean explains. The very next day, Sean knocked on doors – 98 of them. He asked each person, “I know this sounds crazy, but have you ever thought about selling your home?” Many slammed the door. Some didn’t answer. But that day, he found three leads. His first sale was a referral from one of those people. Sean cites his family as a major motivation for him. His parents and other family members helped him out with gas money to get to showings early on. He’s paid his parents back by paying off their mortgages and by spending as much time with them as he can. He also cites his girlfriend, Stephanie Haley, as his rock. He says, “She believed in my vision from day one.” Stephanie eventually quit her job to join Sean, assisting with paperwork while Sean met with buyers and sellers. Finally, his community inspires him! “I love this little town and I have huge plans to make our community flourish,” says Sean. His passion for his community shines through everything he does. Sean, thinking back to his days of driving miles away to do something simple like seeing Santa, started an Evening with Santa event, bringing the big guy himself to Sayre, PA. Sean also started a popular online TV show, #communityconnect, that tells the stories of local business owners. In fact, creating this TV show and running every aspect of it has given Sean a new hobby in videography. While he now works with professionals on some aspects of the show, he learned that he enjoys storytelling through video. 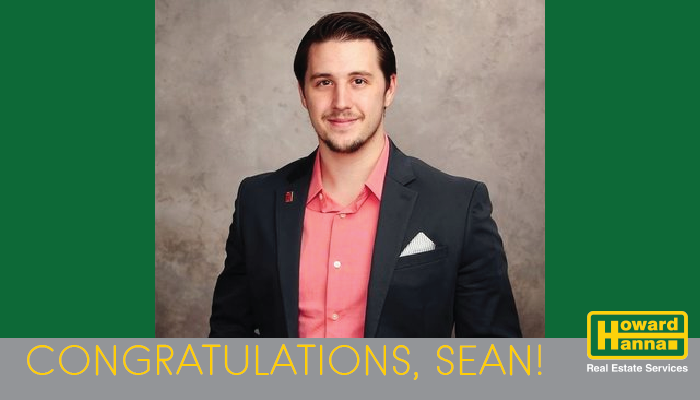 When he’s not selling homes, Sean also enjoys shark diving, golfing, flag football, and traveling. Finally, Sean says, it’s important for real estate agents to find great mentors. His good friends, mentors, and brokers, Thomas Saveri and Raul Azpiazu, have helped him navigate the early stages of becoming a young businessman. He credits them with opening doors for him, providing training, life advice, and help with personal growth. You can find Sean on his website, Instagram, Facebook, and Twitter.